Sitting around a bonfire is a time-honoured way of enjoying good company and passing a relaxing evening. Toasting smores, tossing back a few brewskies, chatting, and simply relaxing all go better with a controlled fire as a centerpiece. That can be a great thing when done responsibly on a camping trip. But there’s no reason it has to be limited to the great outdoors. Adding a fire pit to your patio provides a great focal point and helps create a comfortable and beautiful focal point for your backyard activities. Your back patio is a great spot to hang out with friends and enjoy the fresh air. Alone, your stamped concrete patio is already a great place to be. But when you add a fire pít, you’re adding an amazing centerpiece. 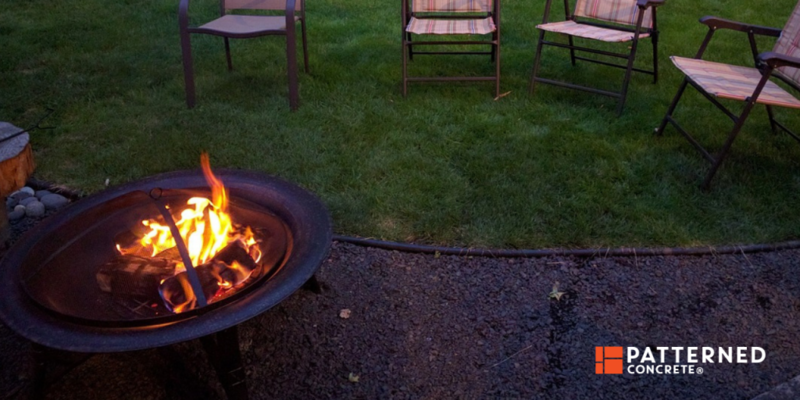 Whether it’s with friends or family, your fire pit can become the social center of your home. Pull up a few chairs or even some logs and sit around to catch up on the latest news. Grab a bag of marshmallows and start roasting them. Just enjoy the warmth and the night sky. There’s a great sense of camaraderie that will come as you sit around this feature. Of course, sometimes three or more is just a crowd and you’d prefer to be alone with your significant other. A fire pit is just fantastic for creating the right mood! Sure, we all know how nice it is to snuggle up in front of the living room fireplace. But the fire pit on the patio offers even more opportunities to create a romantic moment. As the two of you sit on your outdoor loveseat, you can enjoy the dancing flames and sparkling light. Put on some soft jazz or your music of choice. See the light reflect off the windows and the surface of your swimming pool. Look upward and try to pick out the Big Dipper and Orion’s Belt. And if you’re lucky, you can wish on a shooting star that your love will be never-ending. Your fire pit can be a part of unforgettable moments in your love story! Of course, there are times when you just want to be alone. That doesn’t mean you’re antisocial; you just need to escape from the hectic activity of the day. Start a fire and curl up in your favorite chair to enjoy its warmth. Read a book on your tablet, or even the old-fashioned paper kind! Sip on your favorite beverage and enjoy a snack. Sitting in front of the fire can be a relaxing experience, allowing you to clear your mind. Whether you want to do some serious thinking or forget about everything for a while, beside the fire pit is a great place to do it! 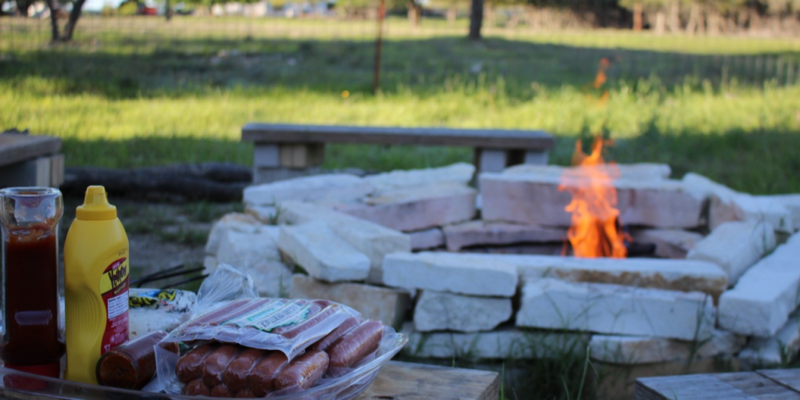 If you don’t have a barbecue grill or want to try something different, your fire pit can do double-duty. While you’ll need some kind of grill shelf to cook on, you can easily prepare a meal over the flame. If you’re looking for the simplest cooking of all, you can just cook hot dogs on skewers. Toasted marshmallows are always a hit, too! One of the fantastic parts of having a fire pit is that you can use it throughout the year. Summer or winter, this will be an enjoyable gathering place. Kick back in the warm weather and enjoy the drier heat given off by the flames. When it gets chilly, you might want to grab a blanket but you’ll end up feeling toasty warm. Unlike so many other outdoor features, you’ll be able to have four-season usage of a fire pit. It helps provide comfort no matter the temperature! When it comes to fueling your fire pit, you have a few options. While wood is the most traditional, you could also elect to go with natural gas or with propane. 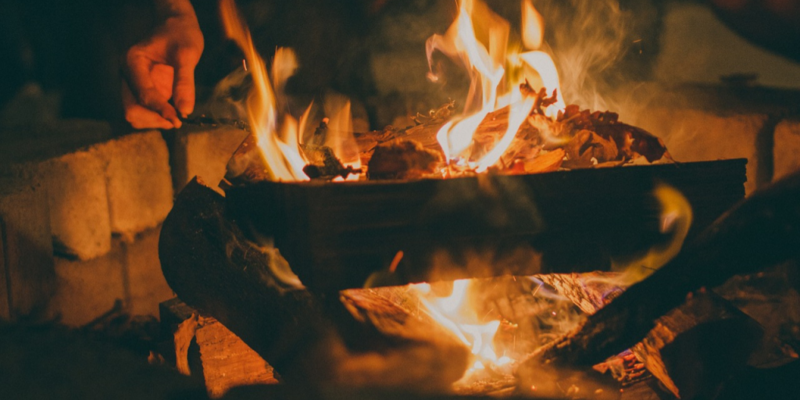 Using wood in your fire pit is probably the first thing you think of. After all, that’s usually what we choose to burn. It can give a great flame and makes it feel like you’re really doing it right. You can build the fire as big as you like (with due respect for safety, of course!). Of course, you have to choose the right wood. Harder woods burn best and throw fewer sparks. It can also be hard to get firewood certain times of year, and at times be difficult to get the fire started if you’re not experienced. If you have access to natural gas service, it’s a great alternative to wood. You’ll have a reliable supply and a steady flame that will look great and is easy to start. Of course, you do need natural gas service to your home to do this, and you’ll need a professional to extend the gas line. Another option for fueling your fire pit is using propane. This gives you another steady, constant flame that is easy to light and will keep going for a long period. Of course, you have to make sure that your tank is kept filled. It can also be tough to design the fire pit to hide a normal-sized propane tank. Of course, remember that even with all its beauty, a fire pit can still present a hazard. It’s important to always be cautious when dealing with an open flame. Most importantly, be sure that children and pets stay at a safe distance from the fire pit. Don’t ever leave them unattended nearby, as curiosity or a slip and fall could put them at risk of serious burns. Remember to protect yourself as well. Don’t wear loose clothing when lighting the fire, and try to avoid materials that are inflammable, like nylon. Never use gasoline or other flammable liquids to start the fire. Build your fire pit at least ten feet from your house and other buildings. If you want one on your deck, go for natural gas or propane, because a wood fire could throw sparks that would catch the deck on fire. Keep a fire extinguisher, a hose, or a bucket of water handy whenever you are using the fire pit in case there are any problems. When you want a perfect addition to your yard and patio, you can’t go wrong with a fire pit. You can enjoy it all year long and it’s great for yourself or with friends and family. If you’re having a new patio installed, it’s a perfect time to add the fire pit! But it’s still something you can add later on and have it made of the same fine stamped concrete that you used for the patio itself.